Looking at such beauty tells the capabilities of Native American art! 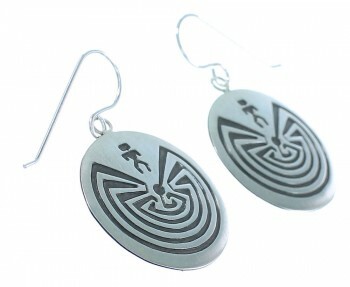 This piece of Native American jewelry is Navajo overlay hand crafted by artist Stanley Gene, out of genuine sterling silver. 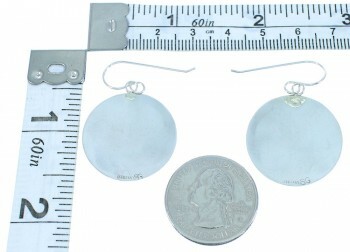 Overlay is a process that utilizes at least two layers of sterling silver or 12KGF. One layer forms the foundation, while the second layer is used to design the individual detailed overlay. 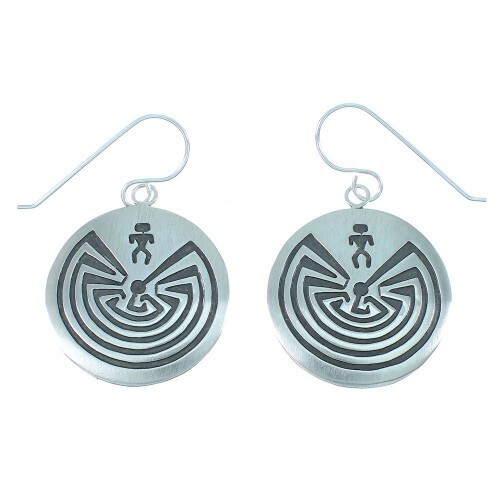 In this pair of earrings, the second layer forms lovely man in a maze designs for a magnificent look. In Native American belief, the symbol of the man in a circular maze of seven paths represents the paths and cycles of life one must be guided through. The imagery represents the journey of life and is deeply connected to one's own ancestry in the path they take. This symbol represents the idea that life's journey is not always easy. The earrings are stamped sterling and hallmarked.